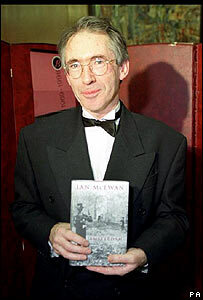 Authors including Will Self and Ian McEwan have protested against the organisers of the London Book Fair being involved in the arms trade. In a letter published in The Times Literary Supplement, the writers called for Reed Exhibitions to stop holding arms fairs around the world. Nick Hornby, JM Coetzee and Mike Leigh also signed the letter organised by the Campaign Against Arms Trade. A spokesman for Reed said it "utterly respects" the writers' opinions. The company, who organised Europe's biggest arms fair in London last year, added that every country has the right to defend itself and the event had "complied with all legislation". Its spokesman also said that the arms fair was just one of many exhibitions it has been responsible for staging. "We are appalled that our trade should be commercially connected to one which exacerbates insecurity and repression, and which props up regimes inimical to free expression," stated the letter. Other signatories included Mark Haddon, Nadine Gordimer, Arabella Weir, Graham Swift, Adam Thorpe and Yann Martel. "We call upon Reed Elsevier to end its involvement in a dirty and damaging business, and upon our colleagues to encourage Reed Elsevier to take the book trade out of the arms trade," it continued. The London Book Fair is due to take place at the Excel Centre in east London from Sunday, the same venue where the arms fair took place in September. Last year medical journal The Lancet criticised Reed - its proprietor - for having a "connection to the arms trade". The book fair is one of the major events in the literary calendar, attracting publishers, book sellers and authors, which was held at Olympia in west London until last year.